Luxurious waistbeads that enhance every woman's beauty. Announcement Royal Waistbeads are the highest quality, expertly-crafted, custom-fit adornments for the waist. Ourbest selling waist beads evoke feelings of luxury, sensuality, and empowerment. We put a modern touch on an age old tradition, using gemstones and a colorful assortment of specialty beads to create jewels that can be worn by every woman. We use best quality products (including Sterling Silver Clasps at no additional charge) to bring you high quality, lasting and great-looking wearable art. Custom design requests are welcome! Feel free to visit our official website at www.RoyalWaistbeads.com to learn more about the meaning behind this beautiful form of body jewelry. Royal Waistbeads' custom-fit African- and Caribbean-inspired waistbeads enhance every woman's beauty with a little shine. Our belly beads and other jewels are made with colorful high-quality glass beads, symbolic gemstones, and durable wire for long lasting luxurious adornments. Sterling Silver clasps are used in most styles (gold-tone and genuine copper clasps are used where noted). Embrace your inner queen. Adorn yourself Royally. Royal Waistbeads are the highest quality, expertly-crafted, custom-fit adornments for the waist. Ourbest selling waist beads evoke feelings of luxury, sensuality, and empowerment. I love the fact that the owner of the shop is so professional. Her responses to my inquiries were so quick and went the extra mile in making sure my order came on time and perfect. I love the belly waist. I will definitely shop for more. Thanks for the effort. Love my waistbeads, its exactly how I envisioned them. Beautiful!!! Well made, excellent customer service. Will order again. We are a mother-daughter duo who loves to create waistbeads that evoke feelings of luxury, sensuality, and feminine empowerment. Best selling waist beads waistbeads by a mother-daughter duo who love to craft! All images and designs are copyrighted and trademarked. Written permission to use or reproduce images or designs must be submitted and approved in writing. 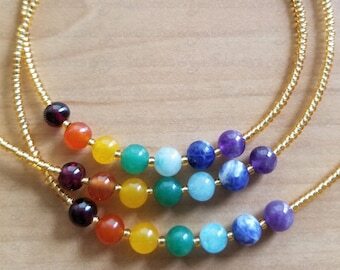 Welcome to Royal Waistbeads Adornments & Jewelry, thanks for visiting! You’re going to adore being Royally Adorned in our custom fit waist beads, also known as belly beads, waistlets, or beaded waistbands. Fall in love with these quality pieces that serve a variety of purposes, from keeping you aware of your weight changes, to giving you a boost of confidence in your femininity, to simply being a pretty accessory – a necklace or bracelet for your waist. Adornments made with gemstones carry further significance, as the stones typically represent qualities such as love, strengthened relationships, purity, balance, and energy. Your waistbeads can be worn underneath your clothes in private (as per tradition) or shown off at the beach and pool, and some styles can be worn during daily showers. For some styles, it is suggested to remove them before your daily showers. They can be cleaned as needed with gentle jewelry cleaner. We are a mother-daughter crafting duo who encourages women to feel happy in their own skin, no matter their age, shape, or color. We want our customers to think of themselves as queens, to embrace the things that help them feel royal in their everyday lives, and to choose waistbead styles that resonate with their unique identities. It's all about your personal identity. Royal Waistbeads reminds you to feel ultra-feminine, and always confident in your own skin. We are also happy to accept custom requests to help you express your story with your adornments. All Royal Waistbeads are custom-made to size; therefore, we are unable to offer refunds or exchanges once your item has been made. We will work with you to provide size adjustments as necessary. We will craft your waistbeads according to the length specified in your original order or a new size if you notify us within an hour of your purchase. We ask that you measure yourself carefully in the position of your midsection where you want your waistbeads to hang before placing your order as a fee will apply to resize your waistbeads once the order is completed. When measuring yourself, the tape measure should be snug but not too tight. If you find that you wish to have a different size after your order has been completed, a small fee will apply to cover labor, return postage, and the price difference for the new size if the new size is larger. The fee will be communicated on a case-by-case basis as it will depend on the degree of the repair and any cost difference between the old size and the new size. Some size adjustments can be made quickly while others require that all the beads be re-threaded on a new strand. We proudly accept payments through Paypal and through all major credit/debit cards. Visit our website to purchase items using Stripe. Please be sure your address is correct when completing your order. Contact us immediately if you’ve noticed an error. Often, we are able to create and ship orders within 1-3 business days. Current processing time on orders is 1-3 business days. As all of our waistbeads are handmade to order and custom-fit, please allow up to 1 month for us to create and deliver your waistbeads during busier seasons. We string our beads by hand, one bead at a time; many of our styles use the micro beads. This is a tedious process and we want to take the time to ensure that we provide a quality product according to our high standards. First Class domestic mail generally arrives in three to five days but these shipping times are not guaranteed by the post office. To upgrade to Priority Mail which generally arrives in two to three days or to upgrade to Priority Mail Express which generally arrives in 1-2 business days (US addresses only), please purchase the appropriate option for the shipping upgrade with your order. Priority Mail and Priority Mail Express adds insurance protection to your shipment. In the event that a package is lost in the mail through no fault of our own (i.e., there is no delivery confirmation and the customer has not received the package), we will replace your items. Lost packages will be replaced, not refunded. *INTERNATIONAL CUSTOMERS* Orders are typically sent via First Class Mail. That type of mail is quite reliable and is the most economical. First Class International Mail Tracking is now provided for packages destined for the following countries: Canada, Australia, Belgium, Brazil, Croatia, Denmark, France, Germany, Great Britain and Northern Ireland, Israel, Netherlands, New Zealand, Spain and Switzerland. Another option to consider is International Priority Mail. It is more expensive, but includes a reliable tracking number and insurance. Packages typically arrive (for most countries) in six to ten business days (although this estimate is not guaranteed). This method of mailing also includes insurance. If you are interested in upgrading your postage to International Priority Mail, please contact me for a quote. Depending on how you want to wear your waistbeads, you can measure yourself above your navel, just at your navel, or right above your hips. Use a tape measure and measure against your bare skin without sucking in your stomach. You shouldn't hold the measuring tape loose nor too snug. If you do not have a tape measure, you may improvise with some string and a ruler. Think about where you want to wear the beads. Underneath your clothes, around your navel? With a bikini, draped just above your bikini bottoms? With a crop top, sitting above your pants? Choose your size accordingly. 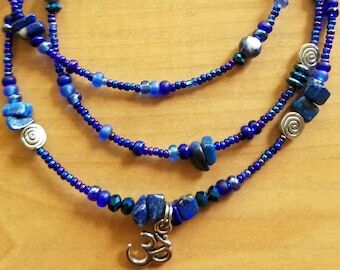 If you want your beads to be versatile, you can request to make them size adjustable with a custom made extension piece made to match your waistbeads. The adjustable piece can be added on by selecting this listing with or immediately after your waistbeads purchase https://www.etsy.com/listing/169213137/extension-piece-dangle-adjust-your-waist?ref=shop_home_active. That way, you can wear them however you like---high or low---and feel free to switch your style up. The adjustable piece is also a popular option for those in the process of losing weight. The extension piece is made so that waistbeads length can be decreased as the wearer's waist size gets smaller. If you're purchasing a Royal Waistbeads item as a gift, special packaging and a hand written note can be included at no extra cost. Please use the "notes" section of your order to inform us of the occasion, shipping address, and personal message to be included in the package. Waist Beads are just like necklaces or bracelets, except they’re worn around the waist or just above the hips. In some cultures, they are a symbol of a woman’s confidence in her body and her sexuality. What materials do you use in your waistbeads? Our belly beads and other jewels are made with colorful glass beads, symbolic gemstones, durable chain, and high quality wire for long lasting luxurious adornments. We use sterling silver lobster clasps for our silver-toned sets and gold plated lobster clasps to close our gold-toned sets. Removable. For versatility purposes, We make our waistbeads so that you can put them on and take them off whenever you like without damaging them, and switch out your styles as your outfits change.